WORK is set to start on improving the trouble-hit propulsion system of the Portsmouth-based Type 45 warships. The Type 45s – which include HMS Diamond, Daring, Defender, Dragon, Duncan, and Dauntless – have since their commissioning suffered from reliability problems. There have been several breakdowns while on deployment with one of the most recent being HMS Diamond having to abort a mission in the Gulf in November last year due to propeller problems. The Ministry of Defence has recognised for several years that there are problems, and two years ago the then Defence Secretary Michael Fallon said that it had been a gamble to use ‘risky’ new engine technology for the £6bn fleet of six destroyers that had backfired. Writing to the government’s defence committee, Mr Fallon said in early 2016 that a raft of malfunctions and failures had been identified in the Type 45s’ engine and propulsion systems. But now the MoD has appointed an alliance team led by BAE Systems to carry out the Type 45 Power Improvement Project. 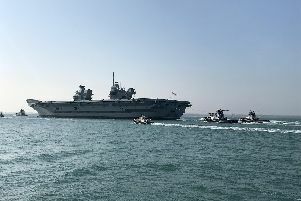 Work will start soon and is due to finish by 2020 – when the Queen Elizabeth carrier will be fully operational and need a strike force escorting her. A deal has been signed between BAE Systems, Birkenhead shipbuilding and conversion specialist Cammell Laird and naval design and technical support expert BMT, and a charter was signed on board HMS Diamond along with representatives from the Royal Navy and MoD to celebrate the alliance. The project aims to improve resilience in the power and propulsion system by replacing the existing two diesel generators, fitting an additional diesel generator and modifying the high voltage system on each ship. BAE Systems Maritime Services managing director David Mitchard said: ‘We are immensely proud to support the Royal Navy’s Type 45 fleet whether at home or on deployment around the world. The installation and replacement of equipment will take place at Cammell Laird’s shipyard in Birkenhead, before a series of harbour and sea trials will enable the ships to return to their home at Portsmouth Naval Base, where they will return to Royal Navy operations supported by BAE Systems, which supports and maintains the fleet.